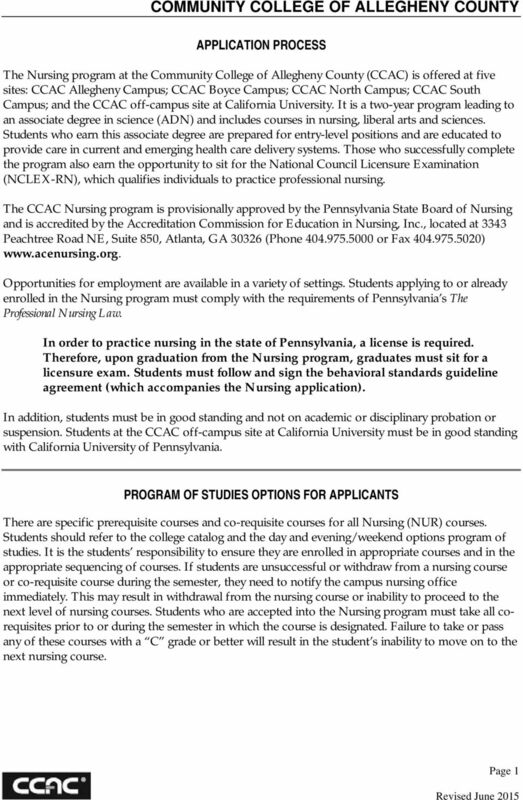 Download "CCAC Nursing Program Information Packet"
12 Nursing (Generic Student) First Year ENG 089 Basic Writing Techniques 3 cr MAT 080 Arithmetic Fundamentals 4 cr Potential Pre Nursing (575.Nursing.POT) (Prerequisites for application) ENG 100 Principles of Composition 3 cr MAT 090 Algebra Fundamentals 4 cr DVS 060 / DVS 070 Academic Strategies/College Reading 2 cr / 4 cr (and) DVS 101 College Reading 2 3 cr DVS 103 Advanced College Reading 3 cr BIO 110 Introduction to Biology 4 cr BIO 151 General Biology 1 4 cr Note: Students may take the Biology Challenge exam if they feel their biology background is sufficient to warrant their enrollment into BIO 161 and/or BIO 175 CHM 109/CHM 109L Introduction to Chemistry & lab 4 cr CHM 110 Introductory Chemistry 3 cr (and) CHM 111 Introductory Chemistry Lab 1 cr High School Chemistry with a lab (Note: Grade must be a C or better) Note: No time limit for Chemistry prerequisite course. Developmental courses (if needed) & all science courses must be completed with a C or better grade & may NOT be taken more than 3 times for acceptance. W and I grades count as enrollment. 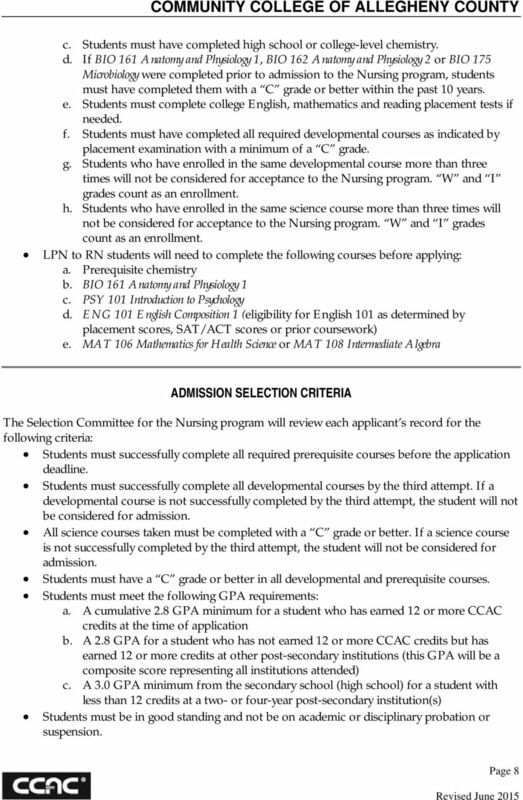 Students must have a minimum cumulative GPA of 2.8 to apply to the Nursing program. 1 st Semester 2 nd Semester 3 rd Semester 4 th Semester NUR 110 Foundation & Health Promotion Concept for Nursing Practice 6 cr NUR 120 Health Assessment Concepts for t Nursing Practice 2 cr PSY 101 Introduction to Psychology 3 cr MAT 106 Mathematics for Health Sciences 4 cr MAT 108 Intermediate Algebra 4 cr Approved Sub BIO 161 Anatomy & Physiology 1 4 cr column are prereqs for NUR 130 Nursing Associate in Science (575.1) NUR 130 Basic Health Practice 6 cr NUR 140 Evidence Based Nursing Drug Therapy 3 cr Courses displayed below may be taken before acceptance into Nursing PSY 108 Human Growth and Development 3 cr ENG 101 English Composition 1 3 cr BIO 162 Anatomy and Physiology 2 4 cr Summer Semester BIO 175 Microbiology 4 cr column are prereqs for NUR 220 NUR 210 Professional Nursing Issues 2 cr NUR 220 Adult Health Practice 4 cr NUR 230 Family Health Practice 4 cr ENG 102 English Composition 2 3 cr column are prereqs for NUR 240 NUR 240 Complex Health Practice 7 cr NUR 250 Leadership & Management Concepts in Healthcare Delivery 3 cr HUMANITIES ELECTIVE (ART, ASL, DAN, ENG, ETH 201, FCL, JRN, MUS, PHL, SPH, or THE) 3 cr column must be completed prior to graduation. 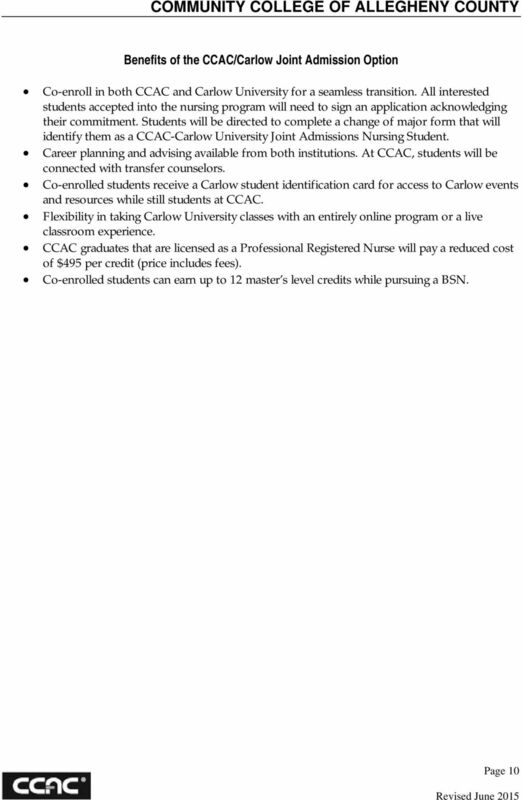 In order to graduate, a student must earn a C grade or above for all courses and when they register for their last term, they must see an advisor to apply for graduation before the deadline date. 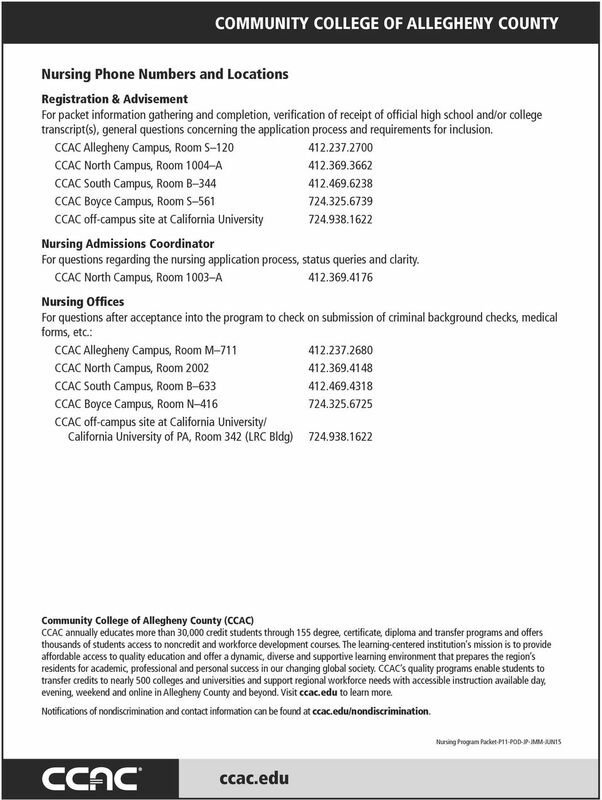 13 California University of PA Nursing Students EDU 110 Critical Thinking & Reading 3 cr ENG 100 Principles of Composition 3 cr Prerequisites: All courses must be completed with a C or better. 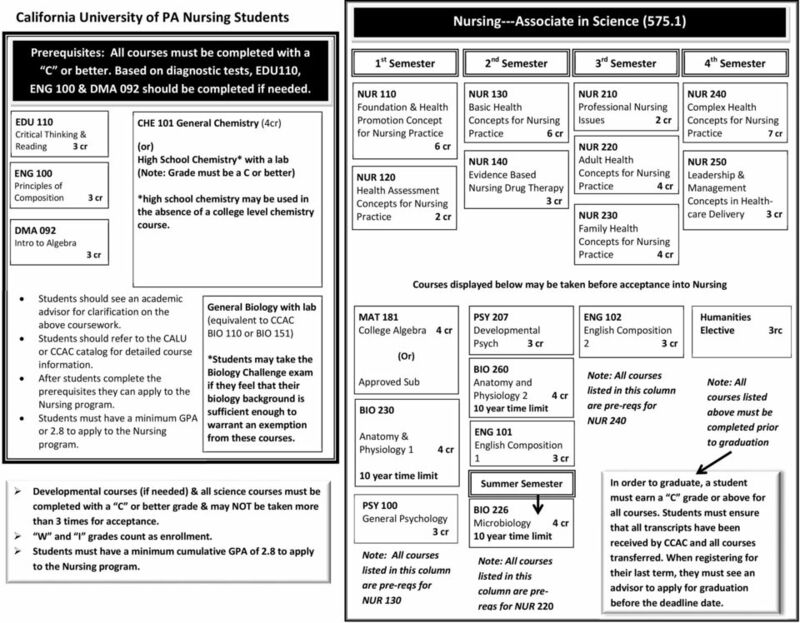 Based on diagnostic tests, EDU110, ENG 100 & DMA 092 should be completed if needed. DMA 092 Intro to Algebra 3 cr Students should see an academic advisor for clarification on the above coursework. 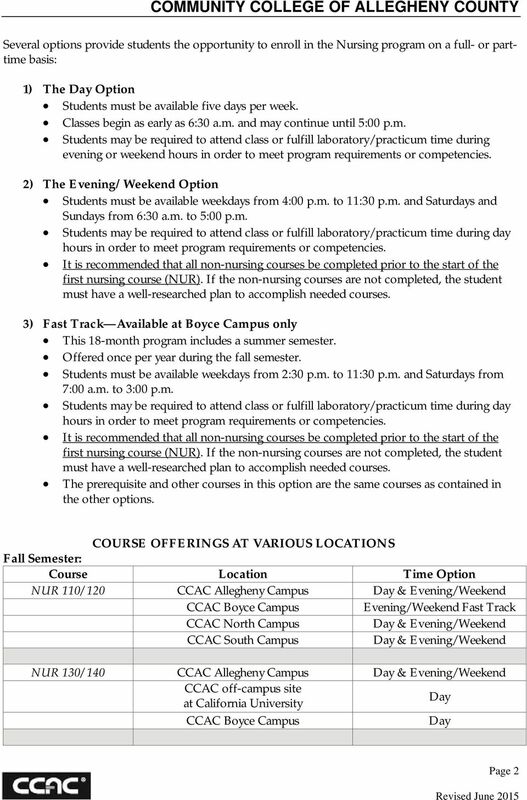 Students should refer to the CALU or CCAC catalog for detailed course information. 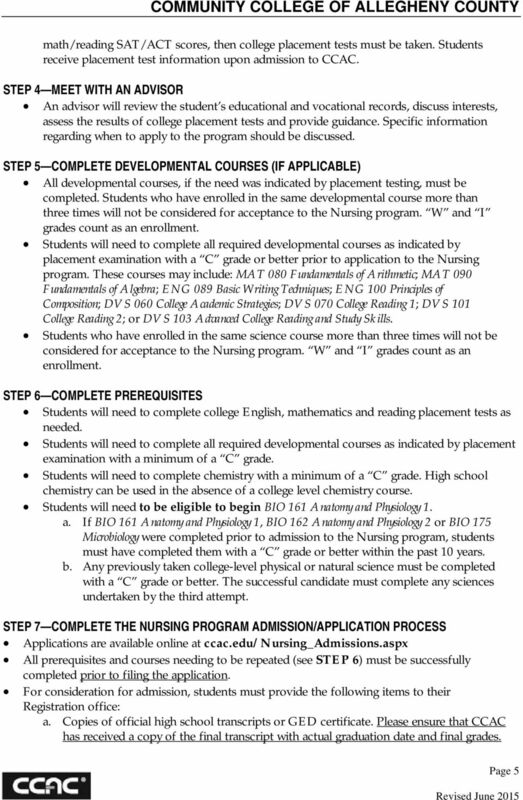 After students complete the prerequisites they can apply to the Nursing program. 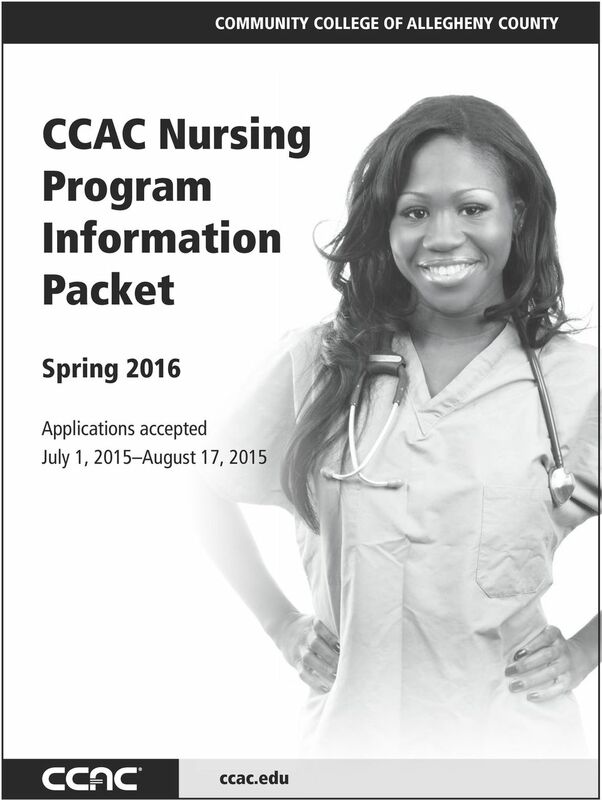 Students must have a minimum GPA or 2.8 to apply to the Nursing program. CHE 101 General Chemistry (4cr) High School Chemistry* with a lab (Note: Grade must be a C or better) *high school chemistry may be used in the absence of a college level chemistry course. 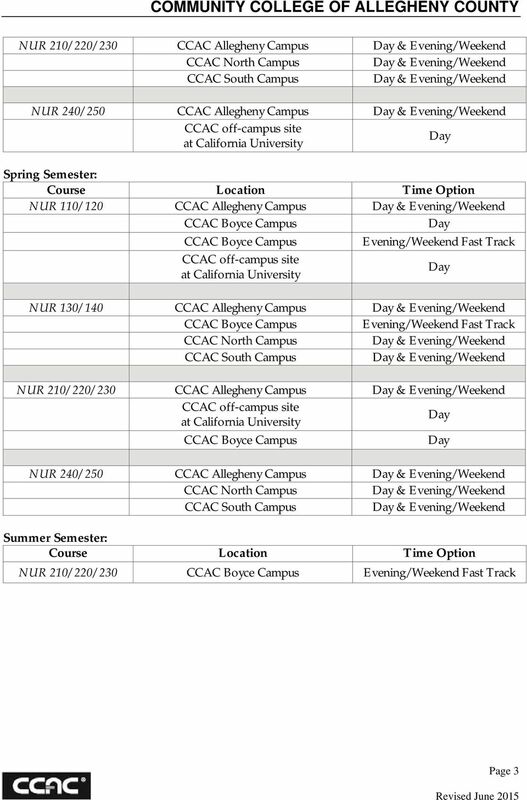 General Biology with lab (equivalent to CCAC BIO 110 or BIO 151) *Students may take the Biology Challenge exam if they feel that their biology background is sufficient enough to warrant an exemption from these courses. Developmental courses (if needed) & all science courses must be completed with a C or better grade & may NOT be taken more than 3 times for acceptance. W and I grades count as enrollment. 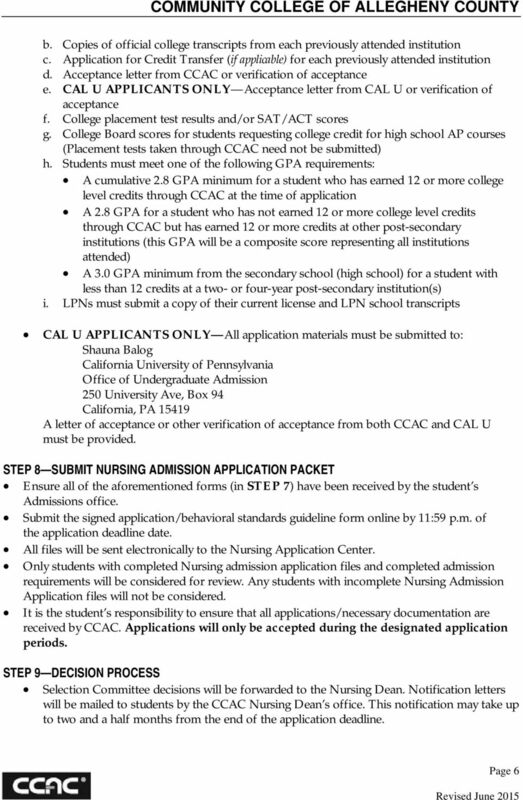 Students must have a minimum cumulative GPA of 2.8 to apply to the Nursing program. 1 st Semester 2 nd Semester 3 rd Semester 4 th Semester NUR 110 Foundation & Health Promotion Concept for Nursing Practice 6 cr NUR 120 Health Assessment Concepts for t Nursing Practice 2 cr MAT 181 College Algebra 4 cr (Or) Approved Sub BIO 230 Anatomy & Physiology 1 4 cr 10 year time limit PSY 100 General Psychology 3 cr column are pre reqs for NUR 130 Nursing Associate in Science (575.1) NUR 130 Basic Health Practice 6 cr NUR 140 Evidence Based Nursing Drug Therapy 3 cr Courses displayed below may be taken before acceptance into Nursing PSY 207 Developmental Psych 3 cr BIO 260 Anatomy and Physiology 2 4 cr 10 year time limit ENG 101 English Composition 1 3 cr Summer Semester BIO 226 Microbiology 4 cr 10 year time limit column are prereqs for NUR 220 NUR 210 Professional Nursing Issues 2 cr NUR 220 Adult Health Practice 4 cr NUR 230 Family Health Practice 4 cr ENG 102 English Composition 2 3 cr column are pre reqs for NUR 240 NUR 240 Complex Health Practice 7 cr NUR 250 Leadership & Management Concepts in Healthcare Delivery 3 cr Humanities Elective 3rc Note: All courses listed above must be completed prior to graduation In order to graduate, a student must earn a C grade or above for all courses. 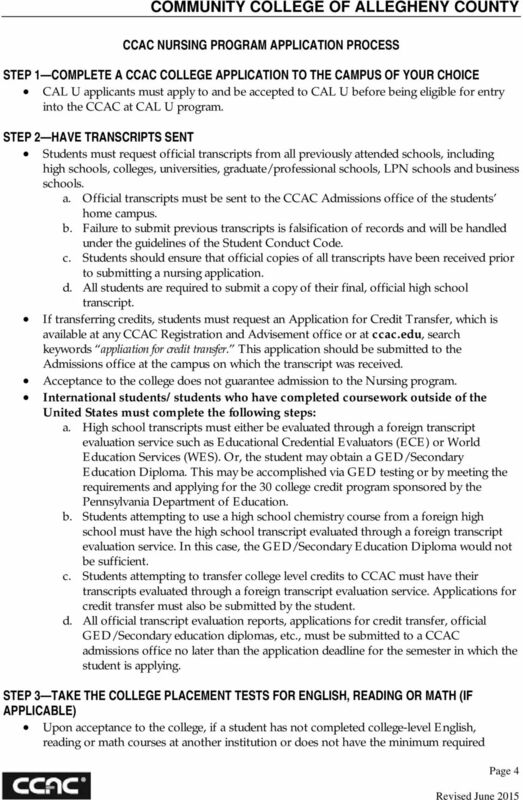 Students must ensure that all transcripts have been received by CCAC and all courses transferred. When registering for their last term, they must see an advisor to apply for graduation before the deadline date. 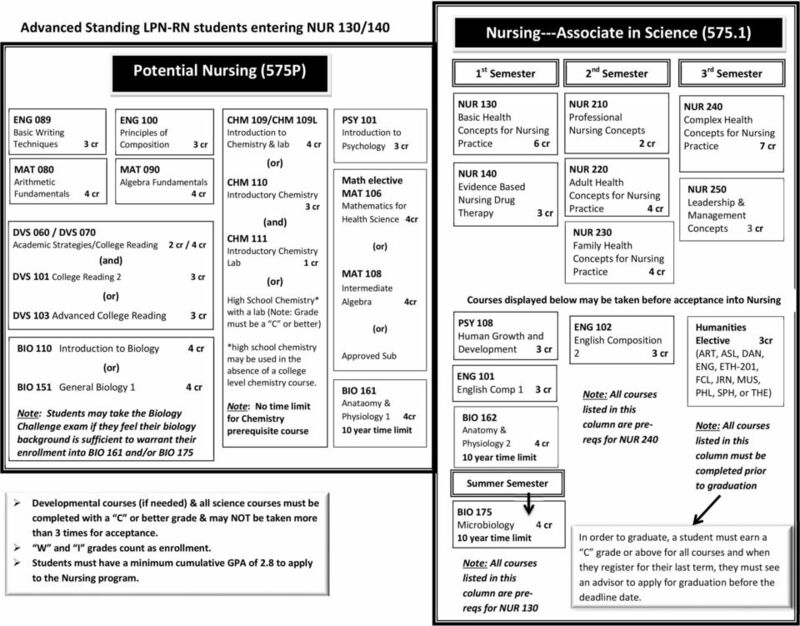 14 Advanced Standing LPN RN students entering NUR 130/140 Potential Nursing (575P) Nursing Associate in Science (575.1) 1 st Semester 2 nd Semester 3 rd Semester ENG 089 Basic Writing Techniques 3 cr MAT 080 Arithmetic Fundamentals 4 cr ENG 100 Principles of Composition 3 cr MAT 090 Algebra Fundamentals 4 cr DVS 060 / DVS 070 Academic Strategies/College Reading 2 cr / 4 cr (and) DVS 101 College Reading 2 3 cr DVS 103 Advanced College Reading 3 cr BIO 110 Introduction to Biology 4 cr BIO 151 General Biology 1 4 cr Note: Students may take the Biology Challenge exam if they feel their biology background is sufficient to warrant their enrollment into BIO 161 and/or BIO 175 CHM 109/CHM 109L Introduction to Chemistry & lab 4 cr CHM 110 Introductory Chemistry 3 cr (and) CHM 111 Introductory Chemistry Lab 1 cr High School Chemistry* with a lab (Note: Grade must be a C or better) *high school chemistry may be used in the absence of a college level chemistry course. Note: No time limit for Chemistry prerequisite course Developmental courses (if needed) & all science courses must be completed with a C or better grade & may NOT be taken more than 3 times for acceptance. 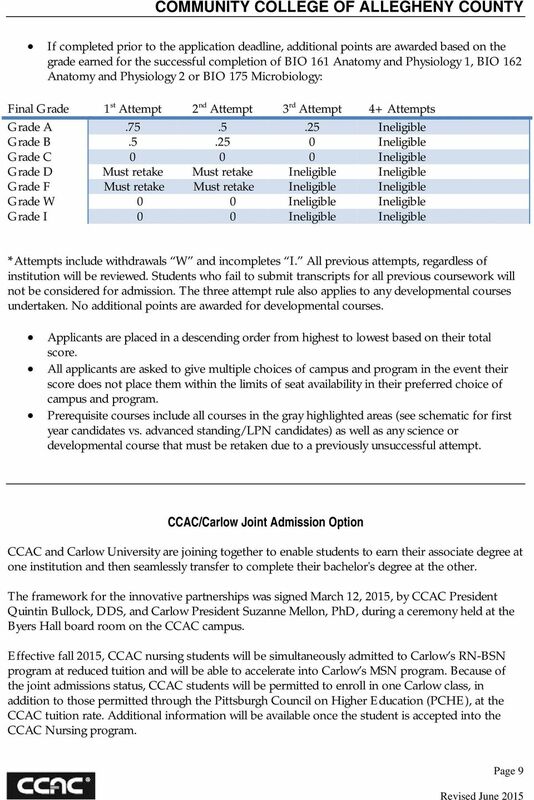 W and I grades count as enrollment. 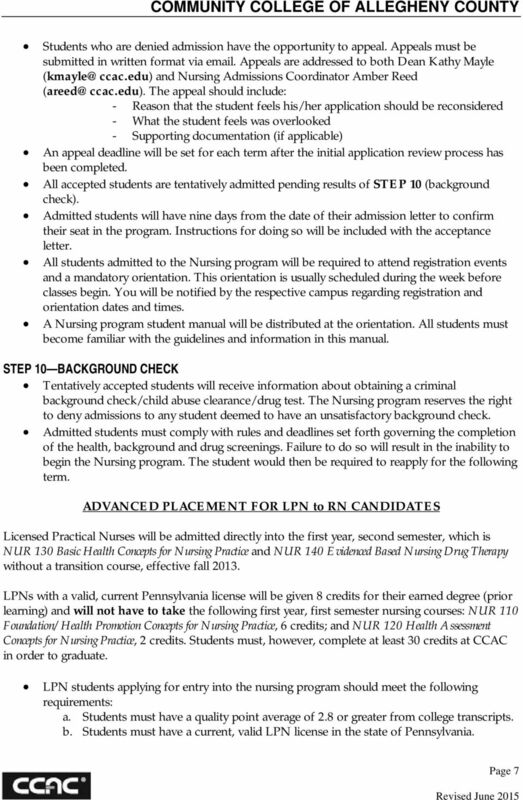 Students must have a minimum cumulative GPA of 2.8 to apply to the Nursing program. 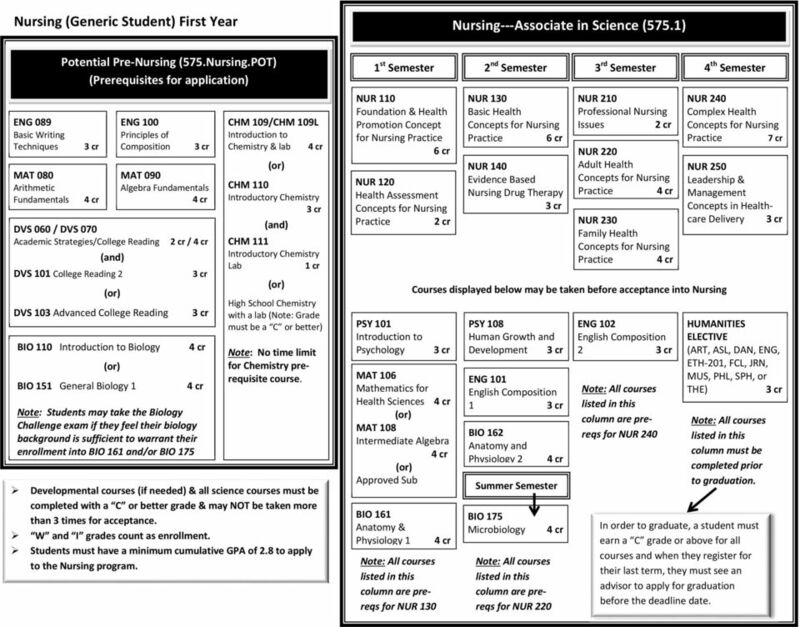 PSY 101 Introduction to Psychology 3 cr Math elective MAT 106 Mathematics for Health Science 4cr MAT 108 Intermediate Algebra 4cr Approved Sub BIO 161 Anataomy & Physiology 1 4cr 10 year time limit NUR 130 Basic Health Practice 6 cr NUR 140 Evidence Based Nursing Drug Therapy 3 cr NUR 240 Complex Health Practice 7 cr Courses displayed below may be taken before acceptance into Nursing PSY 108 Human Growth and Development 3 cr ENG 101 English Comp 1 3 cr BIO 162 Anatomy & Physiology 2 4 cr 10 year time limit Summer Semester BIO 175 Microbiology 4 cr 10 year time limit column are prereqs for NUR 130 NUR 210 Professional Nursing Concepts 2 cr NUR 220 Adult Health Practice 4 cr NUR 230 Family Health Practice 4 cr ENG 102 English Composition 2 3 cr column are prereqs for NUR 240 NUR 250 Leadership & Management Concepts 3 cr Humanities Elective 3cr (ART, ASL, DAN, ENG, ETH 201, FCL, JRN, MUS, PHL, SPH, or THE) column must be completed prior to graduation In order to graduate, a student must earn a C grade or above for all courses and when they register for their last term, they must see an advisor to apply for graduation before the deadline date.